Everything you need to cut, pack, snip, open spaces and determine sizes. 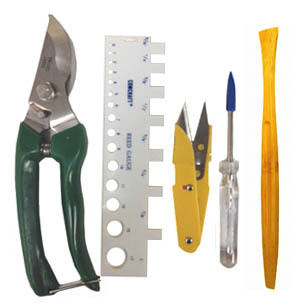 Includes reed cutter, reed gauge, reed trimmers, plastic-handled awl and packing tool in a vinyl drawstring case. Includes reed cutter, reed gauge, reed trimmers, plastic-handled awl and bone awl in a vinyl drawstring case.